Lobuche lies close to the Khumbu Glaciers and has two main peaks – Lobuche Far East and Lobuche East. From the summit, you get to enjoy magnificent views of Everest, Lhotse, Nuptse, Ama Dablam, Cholatse, Pumori and many more. Welcome to Nepal! Upon your arrival in Kathmandu, the historic and beautiful capital city, we receive you at the airport to transfer you to your hotel. Take some time to get your bearings and rest, as you have an epic adventure ahead of you! After checking in, meet our office for our trip preparation and also to meet our crew. In the evening there will be a welcome dinner where we will be able to enjoy authentic Nepali cuisine which will introduce us to the Nepalese food culture. Overnight in Kathmandu. Early morning today we board a small plane for the short flight to Lukla, the departure point for our trek. After arriving at Lukla airport, we meet our other crew members and after some packing and arrangements we take off on foot for the four-hour walk to Phakding. The trekking is easy and the ground smooth as we follow the Dudh Koshi River. 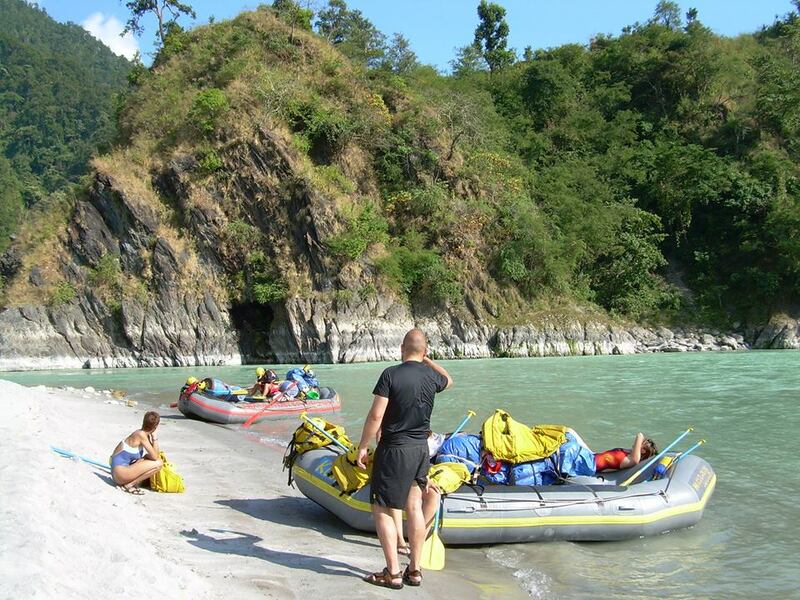 We'll stay overnight in Phakding, a major stopping point for Himalayan trekkers going in all directions. Khumbu villages, splashed with brightly-colored prayer flags dot the way to Namche Bazaar, the largest of the Sherpa villages. Keep your eyes open for Mani stones! It's a six hour hike today, still trailing the Dudh Koshi, and crossing it periodically over precipitous suspension bridges! Today's a day for rest. We believe in gradual acclimatization to prevent altitude sickness, and so today we stop over in Namche Bazaar. The intrepid can opt for a two-hour hike to the famous Everest View, which will help you acclimate and show off some majestic mountain views! By itself, Namche is full of interest. Check out the museum dedicated to Sherpa history and the people's role in helping trekkers - there is a whole exhibit dedicated to Hilary. Do some shopping, and meet the locals. The trekking definitely gets tougher at this point, but the rewards are rich, too. Our path today gifts us with our first views of the Himalayan peaks in their glory: Everest, Nuptse, Lhotse, Ama Dablam, Thamserku and Kwangde. Our stopping point, Tengboche, is known as one of the most gorgeous spots anywhere in the Himalayas. We'll arrive in time to visit the important Buddhist monastery here. The ground grows steeper and the air thinner as we trek towards Pheriche, with mesmerizing views of Lhotse and Ama Dablam. By and by we step uphill. The next part of our adventure steeps over the mountain terrain to Lobuche, a small settlement with amazing views. Take a moment to eye up Mt. Lobuche – we'll be touching the summit within a week! Prepare to snuggle up for a cold night, as we are now almost three miles above sea level and the evenings can be downright chilly! The first part of our day involves the five hour trek from Lobuche to Kala Patthar, a lesser mountain whose name means "black rock." Kala Patthar is popular for an uninterrupted view of Everest from base camp to peak, a sight that can't be enjoyed from the EBC. We'll then hike back down to Gorak Shep, through which we passed on our ascent, for rest and lodging. The trail to Everest Base Camp is a difficult one, involving rocky dunes and moraine, formed accumulation of unconsolidated glacial debris. 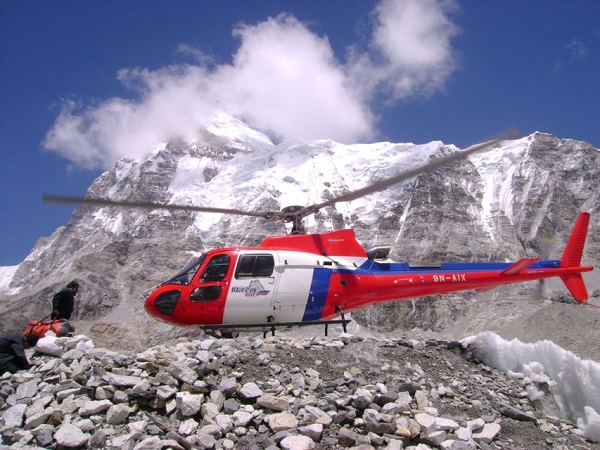 On the way to our destination, we'll approach the famed Khumbu Glacier and icefall, located on the slopes of Everest. At the Base Camp, our goal, you'll have the chance (during the spring climbing season) to meet climbers attempting to scale the mountain’s summit. Capture the unbelievable views of breathtaking beauty. As the afternoon sun starts to wane, we’ll head back to Gorekshep for some much-needed rest and relaxation after a grueling and busy day. It's a five hour trek to the Lobuche Base Camp (LBC). We move forward along the Lobuche Glacier while enjoying great views of Ama Dablam, Cholatse, Pokalde, Thamserku, Kantega and other Himalayas. From the base camp, we continue on a rocky moraine path to reach the High Camp. After reaching there, we set up our camp, take lunch and rest. For the climb, we usually will be climbing on rock surface for up to around 5770m. After that, we climb on ice and use ropes when necessary. However, the use of the rope and the length depends upon the season and the crevasses. Fixed rope is used most of the times whereas man rope is used when required. The climbing leaders will decide what is best for when. The rocky moraine is steep and unforgiving and you might think your hard work is over once we get to the LBC We still have climbing training, however! Overnight in Lobuche East High Camp. We have another acclimatization day planned today, along with additional climbing training to prepare you for our summit push tomorrow. Practice thoroughly, and then rest up - we'll awake before the sun tomorrow. We recommend this extra day for any unforeseen contingency like flight delay, bad weather, requirement of extra acclimatization day etc. With this extra day, we ensure successful climbing despite any unexpected situation. We'll be trekking for ten full hours today in our push to summit Lobuche! The 2am wakeup call is tough, but it will allow us to attain the peak just as the sun is rising, showing off the panoramic views of the Himalayas backlit by the brilliant rays of dawn. 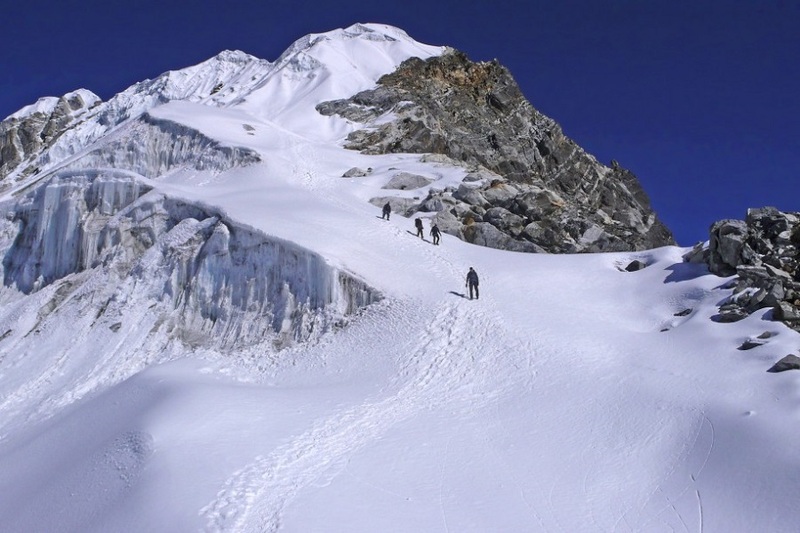 We will most likely be walking on rock surface up to around 5700m after which we climb on ice. We use both fixed rope and man rope as per our leader’s instruction. The climbing surface as well as the length of the rope and depends on the time of the season and the crevasses. Lobuche East offers more panoramic views of the mountains than any other trekking peak. From the summit, you get to enjoy magnificent views of Everest, Lhotse, Nuptse, Ama Dablam, Cholatse, Pumori, and many more. We spend some time at the summit celebrating and taking pictures, then we get back to the High Camp again for an overnight stay. The path is becoming easier as we trek downhill towards Namche Bazaar, and it's much less work this time around to literally stop and smell the flowers – thick forests of rhododendron and juniper in glorious red and pink bloom. On this, our last day of trekking, we cross the spellbindingly gorgeous Khumbu region of the Himalayan foothills en route to Lukla. It's a seven hour trek today, but the grade is gentle and our walking is easy. Savor these final, seemingly endless moments of fresh, cool air, scenic countryside, and the stone steps beneath your feet - all too soon, it will be over! We'll lodge in Lukla tonight, and you'll have the perfect opportunity to do a bit of farewell partying with your trekking group. We're back in the air, only this time going in the opposite direction! We'll hop the 35 minute flight from Lukla back to Kathmandu, leaving ample time to settle in and rest after two solid weeks of trekking. Our journey has come to an end, but we hope your memories of Nepal and the staff of Nepal Trek Ways will last a lifetime! It’s our pleasure to transfer you to the airport in time for your flight home, or to simply bid a fond farewell as you move on to other activities. 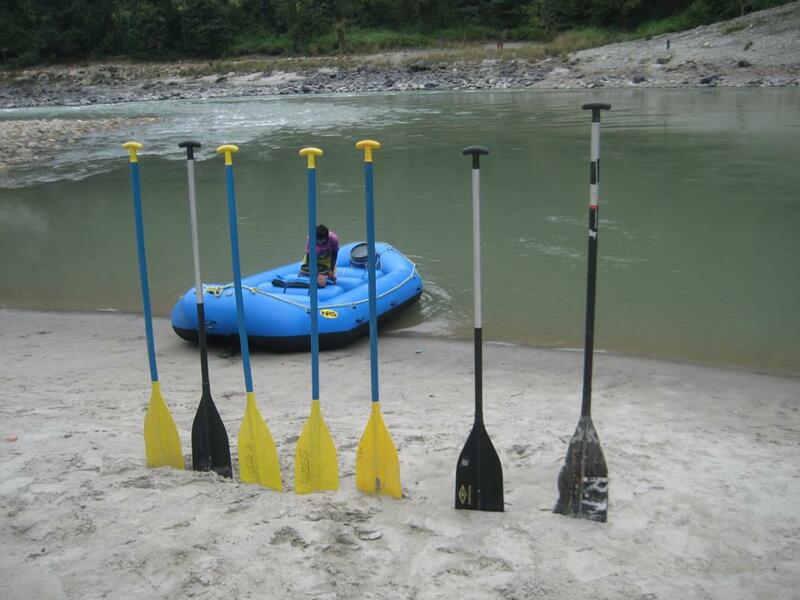 White water rafting in the longest river of Nepal wit h the possibility of fishing for those who are interested.